South Bay Green is a one-stop-shop for sustainable building materials, specializing in non toxic, recycled, and reclaimed finishes for remodels and new construction, at every budget. From flooring to fabrics, and from tile, counters, and carpet to waterless grass, we offer products made from recycled content, renewable resources, and by local craftsman and manufacturers. South Bay Green offers courtesy to the trade and a frequent buyer program for architects, contractors, and designers. We also offer General Contracting, Remodels and Real Estate services to cover all of your needs. After moving from England in 2008 Ben started his career in the design/build world, having worked on both commercial and residential property he has plenty of experience to help streamline your project. Founding South Bay Green with Daniel back in 2011, and relocating their showroom from Venice to Manhattan Beach to be closer to Daniel’s Salzman Design build projects. Whether it’s a new build, remodel, or just new floors, Ben will help you manage your project and find the perfect materials for your budget. Give him a call today to set up an appointment. Daniel is a design and media entrepreneur, with an emphasis on sustainable practices. Daniel began designing and developing spec and custom homesin the Beach Cities in 2004. He felt compelled to find new and better waysto build, eventually founding Salzman Design Build in 2007. To date, Danielhas built and remodeled over 25 homes. In addition, Daniel spearheaded the designand remodeling of his first commercial project… Congregation Tikvat Jacob, one of the firstgreen synagogues in the country. Daniel resides in the South Bay with hiswife Pamela, and three children. Arianna Sabra’s has been creating spectacular home environments with her passion for design and conscious living for almost 2 decades. Whether the client’s residence is a landmark or new construction, Arianna begins her process by understanding the client’s personality–their family, their lifestyle, their tastes. She creates a concept that addresses not only the client’s current needs, but inspires them to think outside the box for a sleeker version of their surroundings. 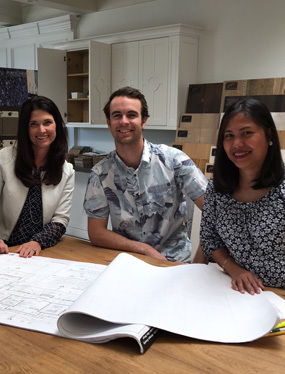 Daniel and Arianna partner on spec and custom homes from initial design to furniture and accessories … making each project uniquely stunning. Gary Stiles founded Stiles Construction company after more than two decades of experience in the construction industry. He learned the basic building blocks of his craft from his father, who started his own construction business in 1966. Gary & Daniel partner together to build beautiful spec and custom homes that keep pace with the latest industry trends and developments. Kim, Sixer, and Shella make up our team of support staff. With a variety of tasks, the support staff is readily available to step in and help make each project a success … from ordering materials to bookkeeping … be assured these 3 help get the job done!